Professor Margo Schlanger's data shows how the Prison Litigation Reform Act closed the courthouse door on incarcerated people seeking protection of their civil rights. The Prison Litigation Reform Act, which made it much harder for incarcerated people to file and win civil rights lawsuits in federal court, was a key part of the Clinton-era prison boom. It turned 20 years old last week. The filing rate by incarcerated people dropped significantly after the passage of the Prison Litigation Reform Act. 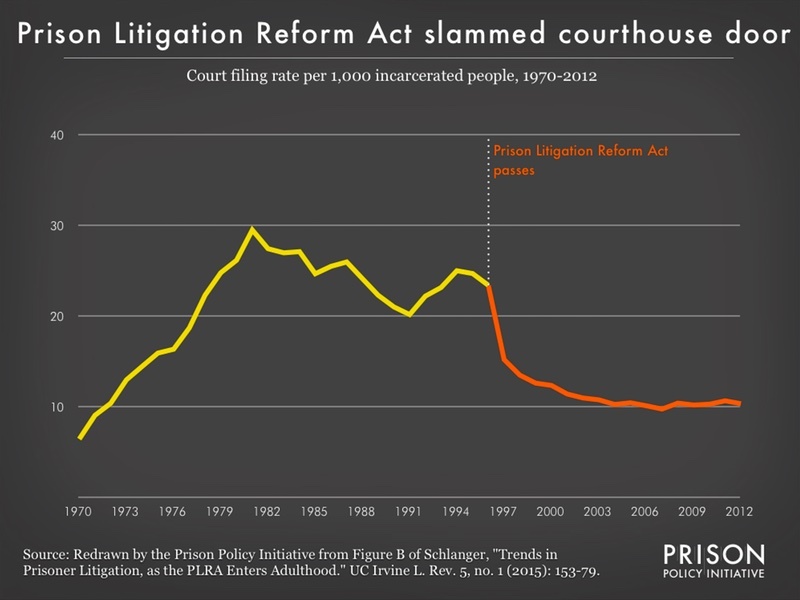 And ironically, despite Congress’ fears of a prison lawsuits flooding the courts, this data that controls for the size of the prison population shows that in 1996, when the Prison Litigation Reform Act was passed, fewer lawsuits per 1,000 incarcerated people were being filed than during the ten year period of 1979-1988. Incarcerated people must exhaust all internal administrative grievance processes available to them within the correctional facility before taking their case to court. Working through these administrative processes can be complicated, have difficult deadlines, and often be fruitless. Since the 1970s, court orders have been a major source of regulation and oversight for American jails and prisons–whether those orders entailed active judicial supervision, intense involvement of plaintiffs’ counsel or other monitors, or simply a court-enforceable set of constraints on corrections officials’ discretion. As existing orders expired, the portion of the incarcerated population that was covered by court ordered protection dropped sharply a few years after the Prison Litigation Reform Act. By the end of 2006, only 7 states had system-wide court order coverage in their jails or prisons. 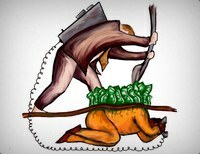 The drafters of the Prison Litigation Reform Act argued that the goal was to limit frivolous lawsuits, which they claimed where rapidly increasing. While the number of prison lawsuits was rising in the 1990s, so too was the prison population. 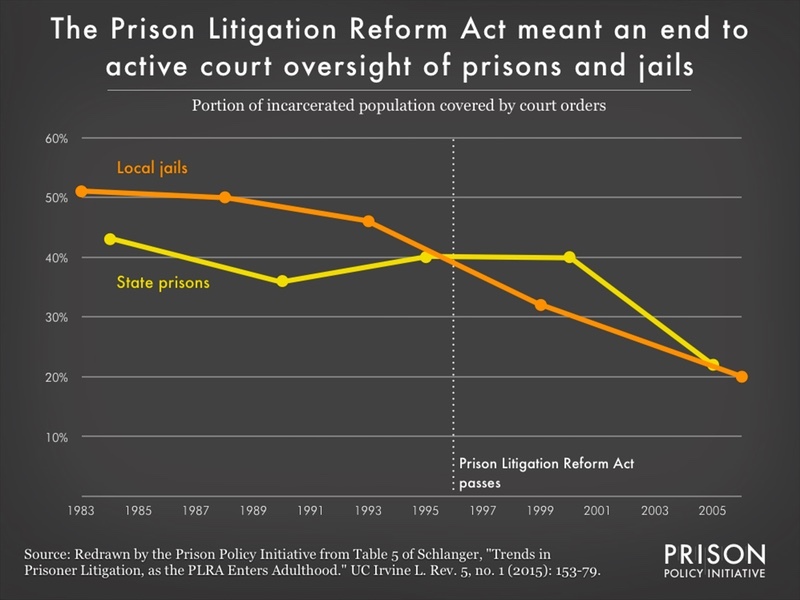 In fact, as Schlanger’s data in the first graph above reveals, court filings were – controlled for the size of the prison and jail population – actually lower than in the previous decade. Now, at a time when the public and many elected officials are questioning the wisdom of mass incarceration, it’s time to reconsider the Prison Litigation Reform Act and the very idea of closing the courthouse doors to cries for justice. Additional work about the Prison Litigation Reform Act by Margo Schlanger includes Civil Rights Injunctions Over Time: A Case Study of Jail and Prison Court Orders and Inmate Litigation.